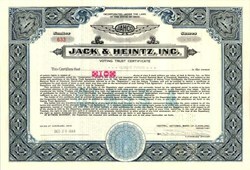 Beautifully engraved certificate from the Jack & Heintz, Inc. issued on December 20, 1944 during WWII. This historic document has an ornate border around it with a vignette of the company's flying wing logo. This item is hand signed and is over 61 years old. Jack & Heintz, Inc. of Cleveland, Ohio were a well-known producer of a wide range of electrical, mechanical, and hydraulic accessory devices for aircraft applications during WWII and the Korean War. The company was founded in late 1940 "to manufacture starter assemblies for aircraft engines" (Aero Digest, 12/40). After WWII they developed a series of engines as part of their new die-cast engine program. Included in the series were a six-cylinder automobile engine plus two- and four-cylinder auxiliary power units. A six-cylinder HOAE was included in the plans. No evidence has been found that the aircraft version of the Jack & Heintz engine was built, but it was reported to have a displacement of 126 cu.in., a maximum power output of 95hp and a rated power of 75hp., with a weight of 200 pounds. There was to be a wide range of interchangeability for components and parts among the various engine applications. There were to be six main aluminum or magnesium die castings; namely the crankcase (including cylinder barrels), cylinder head, oil pan, accessory cover, and front and rear covers. The company also built engines for motorcycles in the post-WWII era.